I took the day off today but I certainly didn't relax. In the morning I had to meet the movers at my boss' apartment. They were 30 minutes early so they had to wait for me. I got there, unlocked the door, and wandered around making sure everything got into boxes. It was cold and I wasn't dressed well enough so I was shivering most of the morning. The movers were supposed to only take 2-2 1/2 hours but they took 3. Then the tow truck driver who was picking up the car my boss donated didn't show up until after 12. I was finally free at 12:30 and went to Home Depot to spend some of the $100 my boss is giving me for supervising his chores. I wanted a cordless sander that I saw online and I thought it would be quicker if I just went in to the store to get it but I missed the fine print that said "online only". 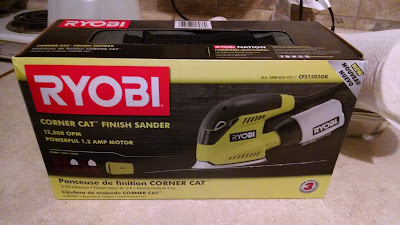 They did have the same sander with a cord so I bought it. My front door is still sticking from the rain and previous water leaks. I tried it out this evening and it is wonderful. So much easier than sanding the door frame with sandpaper wrapped around a block of wood, The door opens without as much force now but it needs more sanding. After Home Depot I stopped for lunch at Taco Bell (my favorite) and then bought shoes at the discount clothing store. I always wear the soles unevenly and the cloth part behind the heal rubs off. I bought a pair for my nephew too but had to exchange them later because he is now a size 12. I should have realized that he isn't done growing. I was able to get back to the mobile home and rest for 1 hour before it was time to pick my nephew up from school and take him for his permit test. Alas, he did not pass. Since I have to take time off work to take him to the DMV, I told him that he has to pay his other aunt for driver's education tutoring on Skype before I will take him back next week. I can't be getting off 2 hours early every week just to have him fail. I hope next week will be successful. After returning the shoes, we stopped by the house to eat dinner, get the mail, fill up water bottles, and take showers with plenty of hot water. I usually take a shower at the house on Wednesdays whenever I can. It saves me from using our finite water supply out at the mobile home. Then back out to the mobile home where I tried the sander on the door, fed the dogs, swept the floor, and wrote on my blog. Whew. That was a busy day off. I did have a chance to get out my old scrap book to see if I kept my ticket stub from the David Bowie concert I went to in high school. Yep, found it. If you haven't figured it out yet, I'm kind of a pack rat. 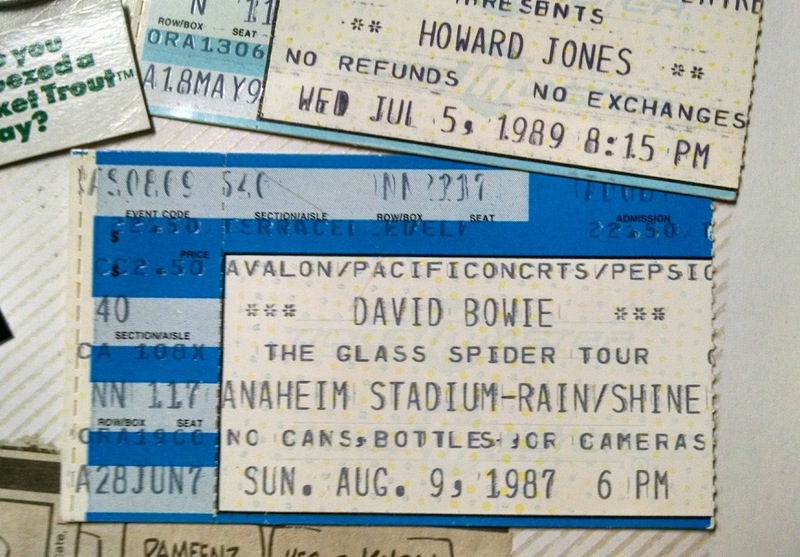 I was a huge Bowie fan in high school. No cameras allowed so no pictures of tiny Bowie on the stage. Oh well, I have the pictures in my head. 12 hours! I saw him at an outdoor stadium. I remember that I was very far away from the stage. Good thing they had large video screens. After that I decided I would rather watch it on TV at home so I could actually see what is going on.